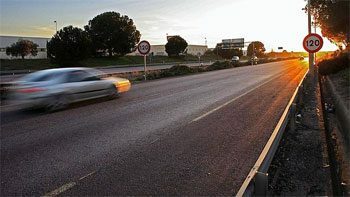 110 km/h will be the new speed limit on Spanish highways (currently at 120 km/h), after the Council of Ministers approved on Friday the reduction as part of an energy saving plan. This temporarily measure will take effect from March 7th. The purpose is to save 15% on fuel consumption and 11% for diesel to balance higher energy bills caused by the crisis in the countries of North Africa. Moreover, the method includes the reduction in the prices of train tickets by 5% to encourage public transport. The Spanish government announced by surprise several measures, which include also an increased percentage of biofuel, which aim to save energy by encouraging public transportation and forcing to consume less oil. However, government sources explained that the decision had more to do with “political” than economic reasons. In fact, it was just yesterday, without any special preparation, and has, according to these sources, primarily a preventive purpose: to raise awareness about the importance of energy efficiency in such a difficult time like the present. One must go back to the 70’s to find a similar initiative on the roads. In the midst of the oil crisis following the Yom Kippur War – which confronted Israel with Egypt and Syria – in 1974, Spain put a top speed of 130 kilometers per hour, which in 1976, following the rise in oil prices was reduced to 100 km/h. It was in 1981 when it was expanded to the 120 km/h that prevailed until now.